After confusing the hell out of the racers with my crude stereo camera rig (two Canon A460s on a mount made from a couple of $1.79 L-brackets), I’ve got a gallery of 3D shots from the 2011 Gator-O-Rama 24 Hours of LeMons at MSR Houston. It’s like you can see the thrown connecting rods and bottles of bribe booze coming right at you! After the jump, click on the image gallery to see Murilee’s inimitable comments and pics from Gator-O-Rama in your choice of 3D or 2D modes. 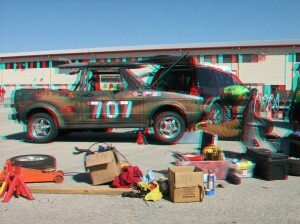 This entry was posted in 24 Hrs of LeMons, 3D Imagery, 3D Photos, Motorsports, Murilee Martin and tagged Houston, LeMons. Bookmark the permalink.